Regulars will remember that nearly two years ago, I reviewed a paper for the Royal Society’s journal Biology Letters, recommended acceptance with only trivial changes (as did both other reviewers) and was astonished to see that it was rejected outright. There was an invitation to resubmit, with wording that made it clear that the resubmission would be treated as a brand new manuscript; but when the “resubmission” was made, it was accepted almost immediately without being sent to reviewers at all — proving that it was in fact a minor revision. What’s worse, the published version gives the dates “Received August 21, 2012. Accepted September 13, 2012”, for a submission-to-acceptance time of just 23 days. But my review was done before August 21. This is a clear falsifying of the true time taken to process the manuscript, a misrepresentation unworthy of the Royal Society, and which provoked Matt and me to declare that we would no longer provide peer-review for the Society until they fix this. By the way, we should be clear that the Royal Society is not the only publisher that does this. For example, one commenter had had the same experience with Molecular Ecology. Misreporting the submission/revision cycle like this works to publishers’ benefit in two ways: it makes them look faster than they really are, and makes the rejection rate look higher (which a lot of people still use as a proxy for prestige). The Society now publicises ‘first decision’ times rather than ‘first acceptance’ times on their website. As I noted at the time, while this is definitely progress, it doesn’t (yet) fix the problem. e.g. See this very new @royalsociety article http://t.co/U1KOHpkONn and note that it has Received and Accepted dates but no Revised date. I was rather surprised to read your recent tweets about us not fixing this bug. I thought it was resolved to your satisfaction. Because newly published articles still only have two dates (submitted and accepted) it’s impossible to tell whether the “submitted” date is that of the original submission (which would be honest) or that of the revision, styled “a new submission” even though it’s not, that follows a “reject and resubmit” verdict. Also: if the journals are still issuing “reject and resubmit” and then accepting the supposed new submissions without sending them out for peer-review (I can’t tell whether this is the case) then that is also wrong. Sorry to be so hard to satisfy :-) I hope you will see and agree that it comes from a desire to have the world’s oldest scientific society also be one that leads the way in transparency and honesty. I feel the changes we have made provide transparency. Now that the Editors have the ‘revise’ option, this revision time is now incorporated in the published acceptance times. If on the other hand the ‘reject and resubmit’ option is selected, the paper has clearly been rejected and the author may or may not re-submit. Clearly if a paper had been rejected from another journal and then submitted to us, we would not include the time spent at that journal, so I feel our position is logical. We only advertise the average ‘receipt to first decision’ time. As stated previously, we feel this is more meaningful as it gives prospective authors an indication of the time, irrespective of decision. After all that recapitulation, I am finally in a position to lay out what the problems are, as I perceive them, in how things currently stand. Even in recently published articles, only two dates are given: “Received May 13, 2014. Accepted July 8, 2014”. It’s impossible to tell whether the first of those dates is that of the original submission, or the “new submission” that is really a minor revision following a reject-and-resubmit verdict. It’s also impossible to tell what “receipt to first decision” time is in the journal’s statistics. Is “receipt” the date of the revision? We don’t know what the journals’ rejection rates mean. Do they include the rejections of articles that are in fact published a couple of weeks later? So we have editorials like this one from 2012 that trumpet a rejection rate of 78% (as though wasting the time of 78% of their authors is something to be proud of), but we have no idea what that number represents. Maybe they reject all articles initially, then accept 44% of them immediately on resubmission, and call that a 22% acceptance rate. We just can’t tell. All of this uncertainly comes from the same root cause: the use of “reject and resubmit” to mean “accept with minor revisions”. Each article should report three dates instead of two. The date of initial submission, the date of resubmission, and the date of acceptance. Omitting the date of initial submission is actively misleading. For each of the statistics they report, add prose that is completely clean on what is being measured. In particular, be clear about what “receipt” means. But a much better and simpler and more honest approach is just to stop issuing “reject and resubmit” verdicts for minor revisions. All the problems just go away then. “Minor revisions” should mean “we expect the editor to be able to make a final decision based on the changes you make”. “Major revisions” should mean “we expect to send the revised manuscript back out to the reviewers, so they can judge whether you’ve made the necessary changes”. And “reject and resubmit” should mean “this paper is rejected. If you want to completely retool it and resubmit, feel free”. It is completely inappropriate to accept a resubmitted paper without sending it out to peer review: doing so unambiguously gives the lie to the claim in the decision letter that “The resubmission will be treated as a new manuscript”. Come on, Royal Society. You’ve been publishing science since 1665. Three hundred and forty-nine years should be long enough to figure out what “reject” means. You’re better than this. And once the Royal Society gets this fixed, it will become much easily to persuade other publishers who’ve been indulging in this shady practice to mend their ways, too. Recently, I published an old manuscript of mine as a PeerJ Preprint. I haven’t touched the manuscript since then (except to single-space it for submission as a preprint). It’s ten years old. That’s a problem because it’s an analysis of a database of dinosaur diversity, and as everyone knows, the rate of recognising new dinosaurs has gone through the roof. That’s the reason I never made any attempt to update and resubmit it: dinosaur diversity is a fast-moving target, and each time through the submit-reject cycle takes long enough for the data to be outdated. So much for the history. Now the question: how should I cite this paper? Specifically, what date should I give it? If I cite it as from 2004, it will give the misleading impression that the paper has been available for ten years; but if I cite it as from 2014, it will imply that it’s been worked on at some point in the last ten years. Both approaches seem misleading to me. At the moment, I am citing it as “Taylor (2014 for 2004)”, which seems to more or less capture what’s meant, but I don’t know whether it’s an established convention. Is there an established convention? Releated: where in mv publications list should it appear? At present I am sorting it under 2014, since that’s when it came out; but should it be under 2004, when it was written? I guess publication date is the one to go far — after all, it’s not unusual even now for papers to spend a year or more in press, and it’s the later (publication) date that’s cited. Help me out. How should this be done? Filed in help SV-POW!, papers by SV-POW!sketeers, PeerJ, PeerJ Preprints, Shiny digital future, What counts? 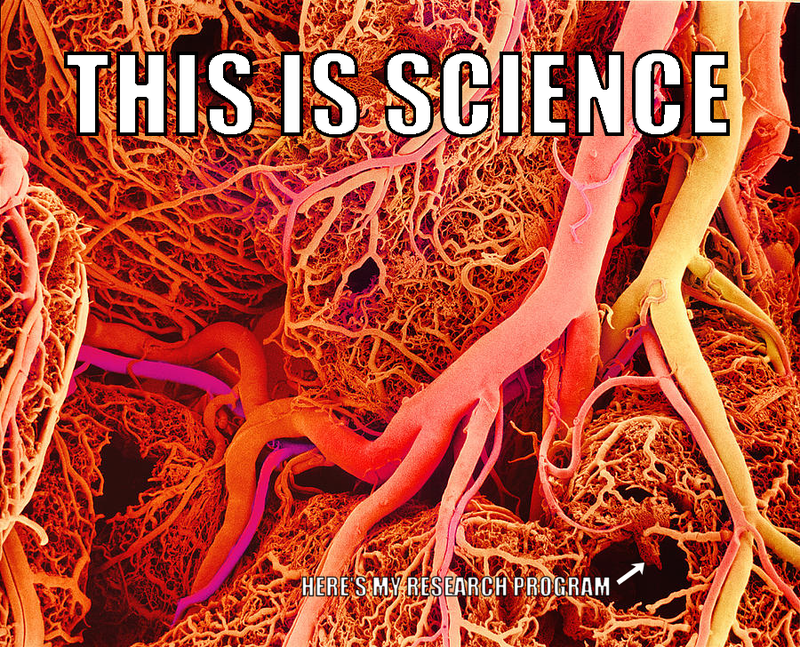 Modified from an original SEM image of branching blood vessels, borrowed from http://blogs.uoregon.edu/artofnature/2013/12/03/fractal-of-the-week-blood-vessels/. I was reading a rant on another site about how pretentious it is for intellectuals and pseudo-intellectuals to tell the world about their “media diets” and it got me thinking–well, angsting–about my scientific media diet. And that truth is this: I can’t tell you what forms of scientific media I keep up with, because I don’t feel like I am actually keeping up with any of them. Papers – I have no systematic method of finding them. I don’t subscribe to any notifications or table of contents updates. Nor, to be honest, am I in the habit of regularly combing the tables of contents of any journals. Blogs – I don’t follow any in a timely fashion, although I do check in with TetZoo, Laelaps, and a couple of others every month or two. Way back when we started SV-POW!, we made a command decision not to list any sites other than our own on the sideboard. At the time, that was because we didn’t want to have any hurt feelings or drama over who we did and didn’t include. But over time, a strong secondary motive to keep things this way is that we’re not forced to keep up with the whole paleo blogosphere, which long ago outstripped my capacity to even competently survey. Fortunately, those overachievers at Love in the Time of Chasmosaurs have a pretty exhaustive-looking set of links on their sidebar, so globally speaking, someone is already on that. The contraction in my blog reading is a fairly recent thing. When TetZoo was on ScienceBlogs, I was over there all the time, and there were probably half a dozen SciBlogs that I followed pretty regularly and another dozen or so that I at least kept tabs on. But ScienceBlogs burned down the community I was interested in, and the Scientific American Blog Network is sufficiently ugly (in the UI sense) and reader-unfriendly to not be worth my dealing with it. So I am currently between blog networks–or maybe past my last one. Social Media – I’m not on Twitter, and I tend to only log into Facebook when I get an interesting notice in my Gmail “Social” folder. Sometimes I’m not on FB for a week or two at a time. So I miss a lot of stuff that goes down there, including notices about new papers. I could probably fix that if I just followed Andy Farke more religiously. What ends up happening – I mainly find papers relevant to specific projects as I execute those projects; each new project is a new front in my n-dimensional invasion of the literature. My concern is that in doing this, I tend to find the papers that I’m looking for, whereas the papers that have had the most transformative effect on me are the ones I was not looking for at the time. Beyond that, I find out about new papers because the authors take it on themselves to include me when they email the PDF out to a list of potentially interested colleagues (and many thanks to all of you who are doing that! ), or Mike, Darren, or Andy send it to me, or it turns up in the updates to my Google Scholar profile. * There is a sort of an arrow-of-inevitability thing here, in that reviewers almost always ask you to cite more papers rather than fewer. Only once ever have I been asked to cite fewer sources, and that is when I had submitted my dinosaur nerve paper (Wedel 2012) to a certain nameless anatomy journal that ended up not publishing it. One of the reviewers said that I had cited several textbooks and popular science books and that was poor practice, I should have cited primary literature. Apparently this subgenius did not realize that I was citing all of those popular sources as examples of publications that held up the recurrent laryngeal nerve of giraffes as evidence for evolution, which was part of the point that I was making: giraffe RLNs are overrated. ** My usual sin is that I mentally categorize papers in one or two holes and forget that a given paper also mentioned C and D in addition to saying a lot about A and B. It’s something that vexes me about some of my own papers. 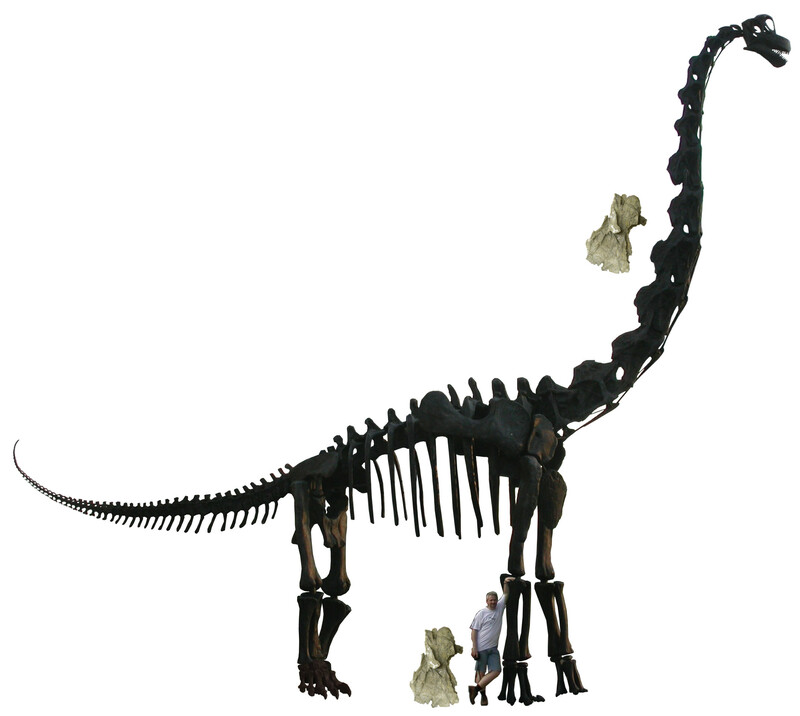 I put so much stuff into the second Sauroposeidon paper (Wedel et al. 2000b) that some it has never been cited–although that paper has been cited plenty, it often does not come up in discussions where some of the data presented therein is relevant, I think because there’s just too much stuff in that paper for anyone (who cares about that paper less than I do) to hold in their heads. But that’s a problem to be explored in another post. Wilson (1999), who IIRC was the first to seriously discuss the interplay of pneumaticity and biomechanics in determining the form of sauropod vertebrae. Yeah, there you go: up until the year 2000, you could learn pretty much everything important that had been published on pneumaticity in dinosaurs by reading five papers and one dissertation. “Dinosaur pneumaticity” wasn’t a field yet. It feels like it is becoming one now. To get up to speed today, in addition to the above you’d need to read big swaths of the work of Roger Benson, Richard Butler, Leon Claessens, Pat O’Connor (including a growing body of work by his students), Emma Schachner (not on pneumaticity per se, but too closely related [and too awesome] to ignore), Daniela Schwarz, and Jeff Wilson (and his students), plus important singleton papers like Woodward and Lehman (2009), Cerda et al. (2012), Yates et al. (2012), and Fanti et al. (2013). Not to mention my own work, and some of Mike’s and Darren’s. And Andy Farke and the rest of Witmer, if you’re into cranial pneumaticity. And still others if you care about pneumaticity in pterosaurs, which you should if you want to understand how–and, crucially, when–the anatomical underpinnings of ornithodiran pneumaticity evolved. Plus undoubtedly some I’ve forgotten–apologies in advance to the slighted, please prod me in the comments. You see? If I actually listed all of the relevant papers by just the authors I named above, it would probably run to 50 or so papers. So someone trying to really come to grips with dinosaur pneumaticity now faces a task roughly equal to the one I faced in 1996 when I was first trying to grokk sauropods. This is dim memory combined with lots of guesswork and handwaving, but I probably had to read about 50 papers on sauropods before I felt like I really knew the group. Heck, I read about a dozen on blood pressure alone. When I wrote the first draft of this post, I was casting about for a word to describe what is going on in science, and the first one that came to mind is “fragmentation”. But that’s not the right word–science isn’t getting more fragmented. If anything, it’s getting more interconnected. What it’s really doing is arborizing–branching fractally, like the blood vessels in the image at the top of this post. I think it’s pointless to opine about whether this is a good or bad thing. Like the existence of black holes and fuzzy ornithischians, it’s just a fact now, and we’d better get on with trying to make progress in this new reality. How do I feel about all this, now that my little capillary of science has grown into an arteriole and threatens to become a full-blown artery? It is simultaneously exhilarating and worrying. Exhilarating because lots of people are discovering lots of cool stuff about my favorite system, and I have a lot more people to bounce ideas around with than I did when I started. Worrying because I feel like I am gradually losing my ability to keep tabs on the whole thing. Sound familiar? Having admitted all of this, it seems imperative that I get my act together and establish some kind of systematic new-paper-discovery method, beyond just sponging off my friends and hoping that they’ll continue to deliver everything I need. But it seems inevitable that I am either going to have to be come more selective about what I consume–which sounds both stupid and depressing–or lose all of my time just trying to keep up with things. Hi, I’m Matt. I just arrived here in Toomuchnewscienceistan. How do you find your way around? Britt, B. B. 1993. 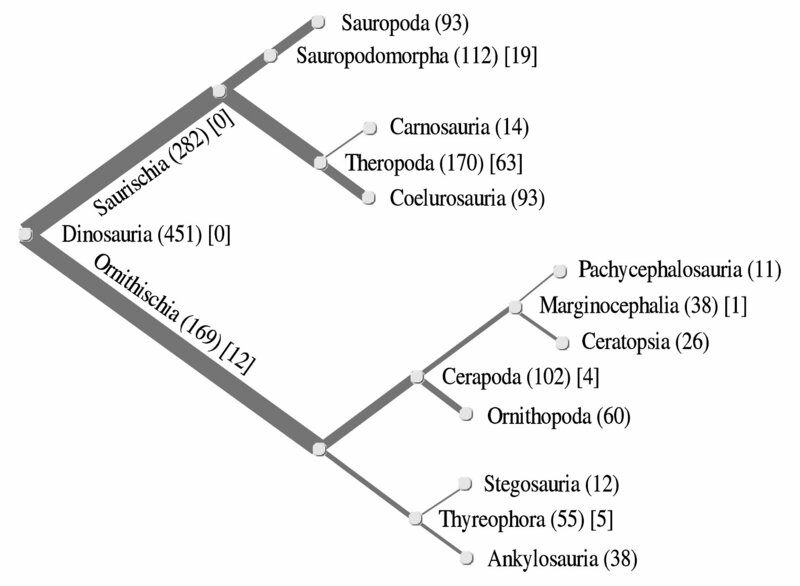 Pneumatic postcranial bones in dinosaurs and other archosaurs. Ph.D. dissertation, University of Calgary, Calgary, 383 pp. Longman, H. A. 1933. A new dinosaur from the Queensland Creta- ceous. Memoirs of the Queensland Museum 10:131–144. McIntosh, John S. 1990. Sauropoda. pp. 345-401 in: D. B. Weishampel, P. Dodson and H. Osmólska (eds. ), The Dinosauria. University of California Press, Berkeley and Los Angeles. Seeley, H. G. 1870. On Ornithopsis, a gigantic animal of the pterodactyle kind from the Wealden. Annals and Magazine of Natural History, Series 4, 5 279-283. Wilson, J. A. 1999. A nomenclature for vertebral laminae in sauropods and other saurischian dinosaurs. Journal of Vertebrate Paleontology 19, 639-653. Witmer, L.M. 1997. The evolution of the antorbital cavity of archosaurs: a study in soft-tissue reconstruction in the fossil record with an analysis of the function of pneumaticity. Society of Vertebrate Paleontology Memoir 3:1-73. Woodward, H.N., and Lehman, T.M. 2009. Bone histology and microanatomy of Alamosaurus sanjuanensis (Sauropoda: Titanosauria) from the Maastrichtian of Big Bend National Park, Texas. Journal of Vertebrate Paleontology 29(3):807-821. Now think of this. Its neck is 8.5m long. Knock of one measly meter — for example, by removing one vertebra from the middle of the neck — and you have 7.5 m.
Supersaurus’s neck was probably TWICE that long. I replied that I was indeed freaked out, and that it had given me an idea for a post, which you are now reading. I didn’t have a Giraffatitan that was sufficiently distortion-free, so I used my old trusty Brachiosaurus. The vertebra you see there next to Mike and next to the neck of Brachiosaurus is BYU 9024, the longest vertebra that has ever been found from anything, ever. Supersaurus is without question the longest-necked animal with preserved cervical material. 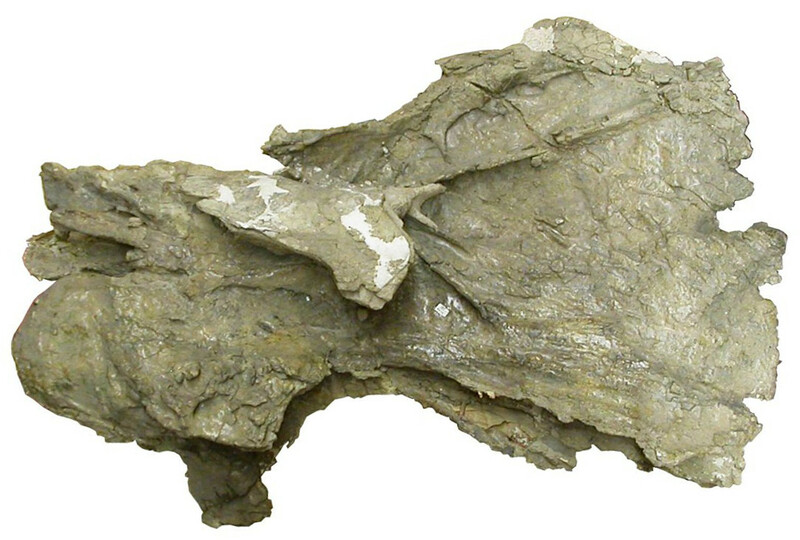 Jim Jensen recovered a single cervical vertebra of Supersaurus from Dry Mesa Quarry in western Colorado. The vertebra, BYU 9024, was originally referred to “Ultrasauros”. Later, both the cervical and the holotype dorsal of “Ultrasauros” were shown to belong to a diplodocid, and they were separately referred to Supersaurus by Jensen (1987) and Curtice et al. (1996), respectively. BYU 9024 has a centrum length of 1378 mm, and a functional length of 1203 mm (Figure 4-3). At 1400 mm, the longest vertebra of Sauroposeidon is marginally longer in total length [see this post for a visual comparison]. However, that length includes the prezygapophyses, which overhang the condyle, and which are missing from BYU 9024. The centrum length of the largest Sauroposeidon vertebra is about 1250 mm, and the functional length is 1190 mm. 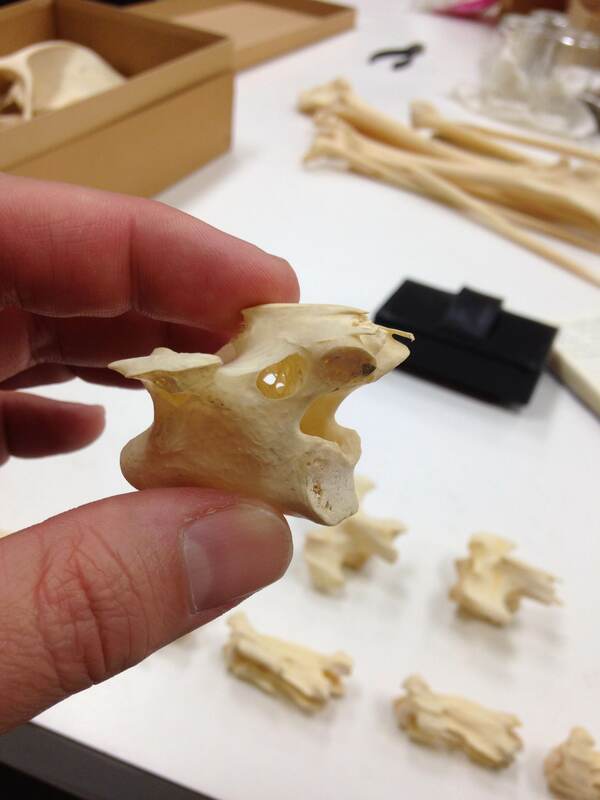 BYU 9024 therefore has the largest centrum length and functional length of any vertebra that has ever been discovered for any animal. Furthermore, the Supersaurus vertebra is much larger than the Sauroposeidon vertebrae in diameter, and it is a much more massive element overall. Neck length estimates for Supersaurus vary depending on the taxon chosen for comparison and the serial position assumed for BYU 9024. The vertebra shares many similarities with Barosaurus that are not found in other diplodocines, including a proportionally long centrum, dual posterior centrodiapophyseal laminae, a low neural spine, and ventrolateral flanges that connect to the parapophyses (and thus might be considered posterior centroparapophyseal laminae, similar to those of Sauroposeidon). The neural spine of BYU 9024 is very low and only very slightly bifurcated at its apex. In these characters, it is most similar to C9 of Barosaurus. However, theproportions of the centrum of BYU 9024 are more similar to those of C14 of Barosaurus, which is the longest vertebra of the neck in AMNH 6341. BYU 9024 is 1.6 times as long as C14 of AMNH 6341 and 1.9 times as long as C9. 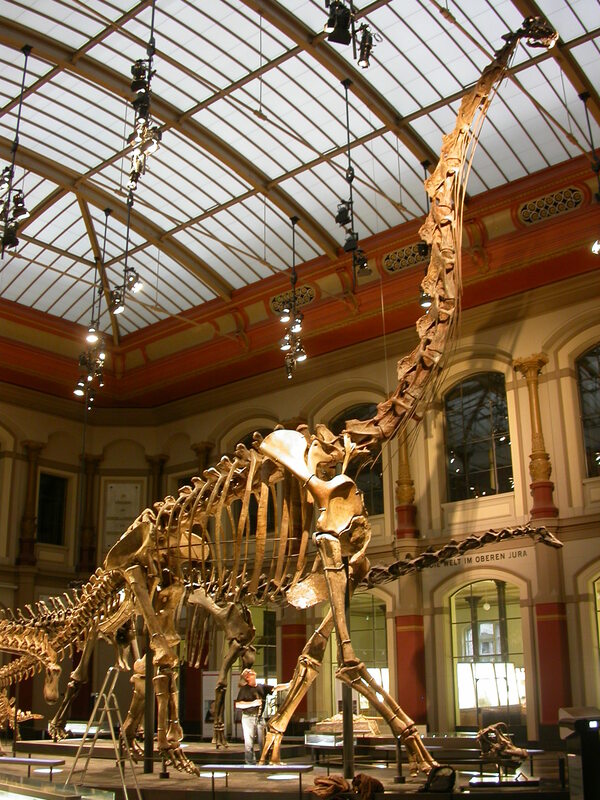 If it was built like that of Barosaurus, the neck of Supersaurus was at least 13.7 meters (44.8 feet) long, and may have been as long as 16.2 meters (53.2 feet). Bonus comparo: BYU 9024 vs USNM 10865, the mounted Diplodocus longus at the Smithsonian, modified from Gilmore 1932 (plate 6). For this I scaled BYU 9024 against the 1.6-meter femur of this specimen. Gilmore, C. W. 1932. On a newly mounted skeleton of Diplodocus in the United States National Museum. Proceedings of the United States National Museum 81, 1-21. Wedel, M.J. 2007. Postcranial pneumaticity in dinosaurs and the origin of the avian lung. PhD dissertation, University of California, Berkeley, Department of Integrative Biology, 303 pp. 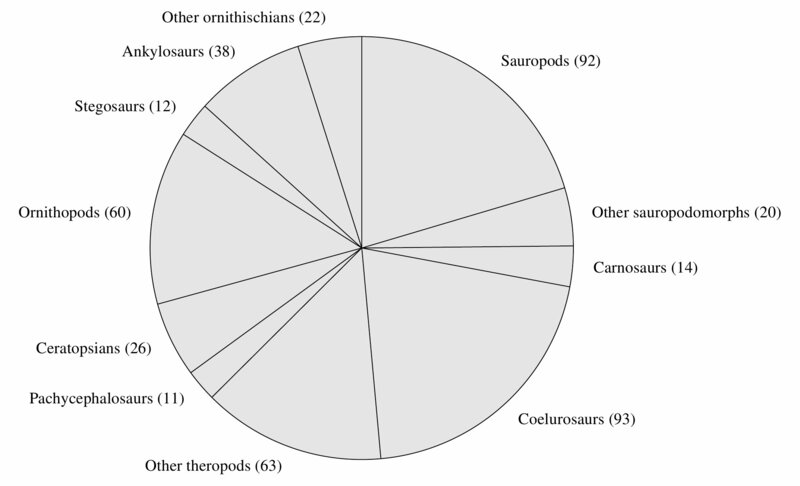 Today, available for the first time, you can read my 2004 paper A survey of dinosaur diversity by clade, age, place of discovery and year of description. It’s freely available (CC By 4.0) as a PeerJ Preprint. It’s one of those papers that does exactly what it says on the tin — you should be able to find some interesting patterns in the diversity of your own favourite dinosaur group. Taylor (2014 for 2004), Figure 1. Breakdown of dinosaur diversity by phylogeny. The number of genera included in each clade is indicated in parentheses. Non-terminal clades additionally have, in square brackets, the number of included genera that are not also included in one of the figured subclades. For example, there are 63 theropods that are neither carnosaurs nor coelurosaurs. The thickness of the lines is proportional to the number of genera in the clades they represent. Yes. It’s actually the first scientific paper I ever wrote (bar some scraps of computer science) beginning in 2003. It’s so old that all the illustrations are grey-scale. I submitted it to Acta Palaeontologica Polonica way back on on 24 October 2004 (three double-spaced hard-copies in the post!) , but it was rejected without review. I was subsequently able to publish a greatly truncated version (Taylor 2006) in the proceedings of the 2006 Symposium on Mesozoic Terrestrial Ecosystems, but that was only one tenth the length of the full manuscript — much potentially valuable information was lost. My finally posting this comes (as so many things seem to) from a conversation with Matt. Off work sick, he’d been amusing himself by re-reading old SV-POW! posts (yes, we do this). He was struck by my exhortation in Tutorial 14: “do not ever give a conference talk without immediately transcribing your slides into a manuscript”. He bemoaned how bad he’s been at following that advice, and I had to admit I’ve done no better, listing a sequence of old my SVPCA talks that have still never been published as papers. If I had written this and sent it to you, you’d tell me to put it online and blog about how I went from idea to long paper to talk to short paper, to illuminate the process of science. And of course he was right — hence this preprint. Taylor (2014 for 2004), Figure 2. Breakdown of dinosaurian diversity by high-level taxa. “Other sauropodomorphs” are the “prosauropods” sensu lato. “Other theropods” include coelophysoids, neoceratosaurs, torvosaurs (= megalosaurs) and spinosaurs. “Other ornithischians” are basal forms, including heterodontosaurs and those that fall into Marginocephalia or Thyreophora but not into a figured subclade. I will never update this manuscript, as it’s based on a now wildly outdated database and I have too much else happening. (For one thing, I really ought to get around to finishing up the paper based on my 2005 SVPCA talk!) So in a sense it’s odd to call it a “pre-print” — it’s not pre anything. Despite the data being well out of date, this manuscript still contains much that is (I think) of interest, and my sense is that the ratios of taxon counts, if not the absolute numbers, are still pretty accurate. I don’t expect ever to submit a version of this to a journal, so this can be considered the final and definitive version. Taylor, Michael P. 2006. Dinosaur diversity analysed by clade, age, place and year of description. pp. 134-138 in Paul M. Barrett and Susan E. Evans (eds. ), Ninth international symposium on Mesozoic terrestrial ecosystems and biota, Manchester, UK. Cambridge Publications. Natural History Museum, London, UK. 187 pp.